The US Masters is the biggest tournament in golf and is staged on the world’s most famous course. 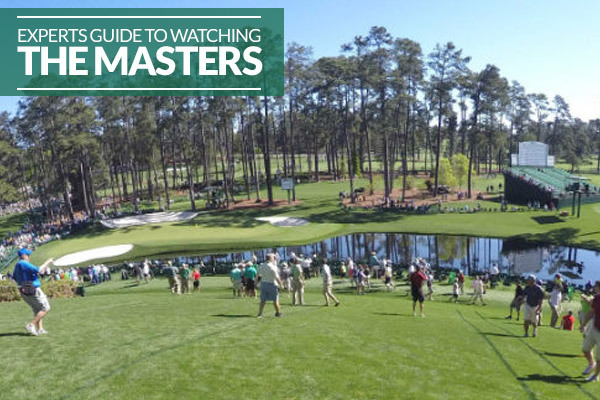 Therefore upon attending the Masters a lot of people will often become overwhelmed by the sheer grandeur of the event and end up up seeing little to no golf at all. I know what you’re thinking… “How is it possible to not see any golf with 7,435 yards of golf course to stand along side?” But trust me there is so much going on that you can easily be swept away in the moment and find yourself stuck in a queue for a Pimento Cheese Sandwich whilst the crowds keep getting bigger and bigger. Having made this mistake once and come away from a day feeling fairly annoyed with myself I am here and with the help of my trusty colleagues (who have too found themselves lost at Augusta National) to ensure the same doesn’t happen to you and have compiled “An Expert’s Guide to Attending the Masters”. Click the buttons below to fast forward to what you want to know. When you first walk into Augusta National it is really easy to get distracted, you’ll be met with a huge array of options and unless have the tiniest bit of discipline it is pretty easy to miss things that you’ll be annoyed looking back, I speak from personal experience! So, before you go in, make sure you note down what you most want to see. This might be the 18th green, the 12th tee, the 16th green, whatever it is, having a list will help plan the rest of your day. From there, I’d pick your number 1, and as soon as you walk in go to this place and put your Master’s chair down in position, even play won’t reach there for hours, leave it there and that’s your spot for the rest of the day, this is a “Masters Tradition” and an unwritten rule that you can sit in these seats when the owner isn’t there but you politely vacate when they come back – or at least that’s what I did. Now you’ll probably have noticed that I mention a “Masters Chair” previously there, this is an absolute must for watching The Masters, whilst there are lots of stands and the viewing points are amazing thanks to the contours of the course, having your own spot is a great place to head back to now and again to have your lunch or just watch the world’s best players go by and do their thing. You’ll need to get one of these from a Masters merchandise store, there is a HUGE one as you walk in (near the practice ground), it has everything you could ever imagine with a Masters logo on it, but the prized buy at this stage is a chair which will give you the ideal position for the rest of the day. Now, if you are walking back after getting your great position on the course, it is quite a good opportunity to do some shopping. I refuse to believe that anyone goes to The Masters and doesn’t buy something with the iconic logo on it. I have polo shirts, jumpers and even a baby grow as memories from my Masters trips. It’s important to visit this as early as you can during your day at The Masters, firstly to ensure you get what you want, I’ve seen some sizes / styles run out, and secondly because you don’t really want to be lugging your Masters merchandise round for the rest of the day, you might want to take this opportunity to store it at YGT’s hospitality facility or in your car if you’ve driven to the tournament. Hopefully these tips have helped you and will make you enjoy your Masters experience even more. 5 – Create your own Masters memories and have an amazing time! Cameras are not allowed in on Tournament Days, so don’t leave without getting your photo taken in front of the main clubhouse. It gets busy, so try and go earlier in the day (that said it is only a 20 minute queue maximum at peak times), this maybe the only option you have to prove you were actually at Augusta. An official takes a photo of you then gives you a unique code to login with online at myphoto.masters.com. Sounds simple and obvious enough but due to being like a kid in a candy store on my first day at the course, I ended up wasting a bit of time, not knowing where to look and what to do. Don’t get me wrong; I still an awesome day. But by day 2 (I was lucky enough to have tickets for the Monday, Tuesday and Wednesday practice rounds) I was like a well oiled Masters-viewing machine and saw so much more in the same amount of time as I did on day 1. I had figured out the best spots on the course from where to see the action up close and personal and while I’m sure this will come down to personal preference – beauty is in the eye of the beholder after all – I’d say it’s pretty tough to beat getting your chair down just behind the 16th tee. On the practice days in particular, you have the players hitting their tee shots into one of the course’s most picturesque holes, and once they’re done, the large majority of them will plop balls down and hit the famous skim shots over the surface of the water. The atmosphere is really jovial and players might even have a few words with you on the practice days…Justin Rose in particular seemed more than happy to have a chat with the friendlier patrons when I attended in 2015. Concessions are really close by too (as are bathrooms which will come in handy if you’ve spent some time enthusiastically sampling the imported beer from your Masters Cups) and you can also get to a handful of other top viewing spots such as the 14th tee from (which you can also see players hitting into the 13th green) very easily indeed. The 16th is on the far side of the course from the main entrance, so without running (strictly taboo in these parts), head straight there to get a front row position for your Masters Chair. 1) Besides the golf, the first thing on everyone’s mind is the shop and buying all the Masters memorabilia that is possible for you, your friends and family. 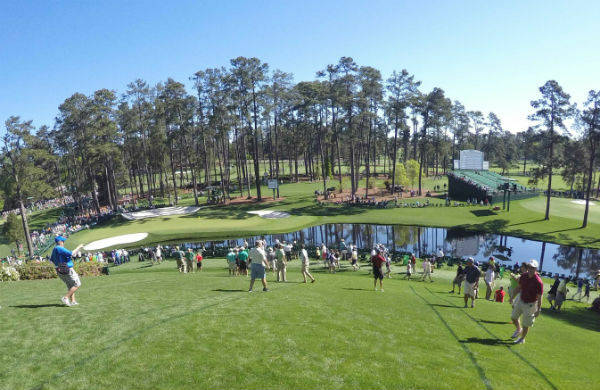 However, as tempting as it is to get that Masters t-shirt or Augusta hat, don’t succumb to pressure and make sure it is the last thing you do before leaving Augusta National or you will be stuck lugging around half of the shop all day. 3) Grab a place for your seat early, it is Masters law that your chair cannot be moved so make sure you get into the course and head straight away to your favourite spot, however DON’T run – you’ll be told off for that! My advice is simple, don’t forget the front 9. 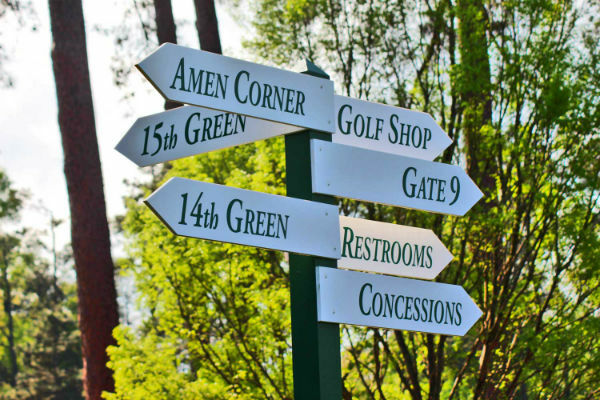 The first time I went to The Masters I, like so many, headed straight to Amen Corner to experience those iconic holes that have shaped many a Masters and then followed play into the 18th. Looking back, I remember feeling a little annoyed that I hadn’t seen anything other than the 1st tee and 9th green. So, when you are at The Masters, be less like me and make sure you get to experience the whole course, there are some great holes, like the 3rd and 4th which look so different in real life and are amazing design examples. Behind 17th Tee – quite a lot of players will hit driver down here so it is a good opportunity to see how the pros play the hole, plus it is an angle you hardly ever see from the TV coverage. The bank on the left of the 16th – head up high and get a birdseye view of the hole and golfers hitting their approaches into the par-5 15th hole, depending on where you position yourself, you’ll also see some hitting it into the par-3 6th as well. You’ll see a lot of action and won’t have to move far. Right of the 10th green – this is just so you can appreciate how difficult this hole is than it looks on TV. The huge elevation changes make this such a demanding proposition. The Masters Chair is the ultimate one…you simply can’t afford not to have one if you want to maximise your time at the course. The Master’s shop is a must too because there’s plenty of great swag and it’s all pretty affordable. I was like a kid in a candy shop when I was in there and went a bit Masters mental, buying almost every variety of Masters cap they had going! A Masters flag is a great souvenir too. I’ve got mine framed up with my old Masters tickets and hung on the wall in my filming studio and it’s a reminder of some great times! Everyone says it but the course is really a lot more hilly than you think so leaving enough time to get from one place to another is a good idea too. I’d always recommend getting your Masters chair down as early as you can then walking around for a few hours before returning to you chair and spending the afternoon sat in the same spot watching the action. Another “expert tip” is just go. If you love golf Augusta is a must. I know I’m lucky that I get to go with Your Golf Travel but it’s so worth the money to get to experience it. Get it booked. Great information. I’m interested in going there next year. Thank you very much for commenting, we have a whole range of packages on our new 2018 Masters web page featuring some great deals! https://www.yourgolftravel.com/us-masters Please do not hesitate to get in contact.